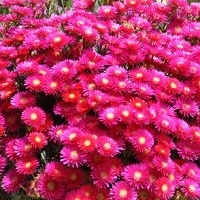 Lampranthus is a large group of succulents with very attractive daisy-like flowers in early summer. There are over 100 species and they all come from Southern Africa. Lampranthus plants are all perennial, and can be grown as small shrubs, ground cover or trailing plants. They have vivid, sometimes iridescent flowers in shades of pink to purple; and more rarely in orange or red.They like sunny conditions and in most species, the flowers open in the sun. Lampranthus plants are tolerant of short periods of frost to -7°C and can be seen growing in the open all year round in the warmer parts of the UK such as the South West and the Isle of Wight. They make good pot subjects for colder gardens, to be brought under cover in deepest winter. The best known is Lampranthus multiradiatus, sometimes called the Ice Plant. It has flowers in shades of pink to purple and forms a small shrublet. It can also be grown as an annual if sown early. A subspecies known as L. roseus can also be grown as an annual. There are cultivated forms of Lampranthus, such as Lampranthus spectabalis "Tresco Fire” or "Tresco Brilliant” which has lovely iridescent red flowers in summer. There is a yellow/orange cultivar of this species. An unusual double flowered Lampranthus can be found called "Double Purple”. By cuttings: Cuttings are best done in summer. Take cuttings of shoot tips, 5-10cm long, strip the lower leaves and keep on a bench few a few hours for a protective skin to form over the cut. Then place cuttings into pots of damp sand or sandy soil and keep in a coldframe until roots are formed. Cutting take easily with little care and attention. 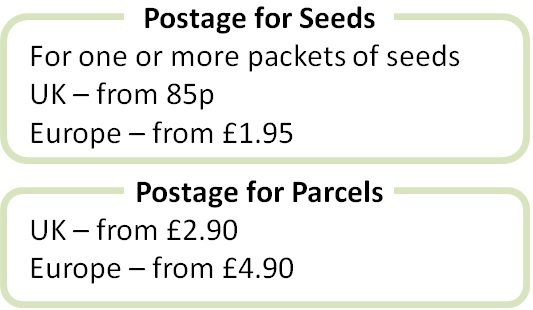 By seed: Seeds can be sown anytime in light sandy soil. Sow on the surface of the soil and keep in the light at a temperature greater than 15°C. Seeds germinate in about 3 weeks. Pot on into sandy soil and out into a sunny part of the garden in well drained soil. Lampranthus plants prefer full sun and well drained soil. Protect from harsh frosts. If kept in pots, water sparingly in winter, re-pot every spring and water more generously in summer. Deadhead the flowers to encourage more throughout the summer. Some plants can be short-lived and become rather woody, so expect to replace them every 3-5 years. Lampranthus can be affected by downy mildew which can be controlled, if needed, by spraying with a general garden fungicide in early spring before flowering.